Work has begun on a new train station in the west of the city that is set to become the public transport lynchpin for huge housing developments proposed in the area. The £25 million Edinburgh Gateway station will also provide an interchange with the tram line, allowing residents from Fife and the north to connect with Edinburgh Airport by train and tram. Network Rail contractors are already on the ground and have begun clearing the site. The station located near the Gogar Roundabout is expected to be in operation by the end of next year. The two-storey building will see passengers able to walk the few dozen metres between train and tram platforms, with easy links to the Gyle shopping centre and bus services. However, the station will not offer services to Glasgow and the west as originally planned, after cuts to the Edinburgh-Glasgow Improvement Programme in 2012 saw a vital spur of track at Dalmeny scrapped to save money. 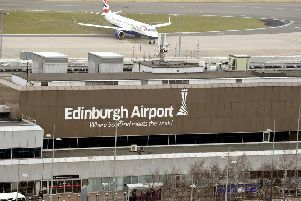 Transport experts said the route would be popular with future residents as it would cut journey times to the city centre in half compared with the tram, as well as becoming a “crucial” travel axis for Edinburgh Airport passengers. Transport consultant Robert Drysdale said: “When Stewart Stevenson cancelled the Edinburgh Airport rail link, he made the point that the Edinburgh Gateway would be an alternative way of getting there by heavy rail. “Ever since the tram opened, there has been increased awareness of making use of that asset, and that suggests that there will be more of a focus on releasing land for housing because it’s a ready-made transport artery, so the Edinburgh Gateway might also have that role. And Paul Tetlaw, a rail campaigner at pressure group Transform Scotland, said that passengers would be impressed with the standard of the hub. A spokesman for Network Rail confirmed that construction firm Balfour Beatty had begun building work. Edinburgh Gateway is at the centre of planning blueprints for the area, with up to 2000 homes proposed for the West Craigs site around the station.